Could you describe the use of hexavalent chromium in your industry? TP: We design and manufacture electrical or optical connectors used in harsh environments, for aerospace, aeronautic, military and industrial applications. The housings and the accessories of our connectors are made of composite materials, aluminium or steel, and we have been using hexavalent chromium for decades in our electroplating process. This substance is used to give our products the anticorrosive properties, electrical continuity and appearance our customers want. Because hexavalent chromium is on the list of prohibited chemical substances, we are working to replace it. Is it possible to replace one product by another? TP: Yes of course, but it takes time. In fact, it's not just that we have a perfect mastery of the use of hexavalent chromium in the treatment of different materials such as aluminium, copper alloys or even certain thermoplastics, but the properties of these products are still far superior to what it is possible to achieve with other substances. So the difficulty is twofold; to make sure that it's possible to deploy the substitute on an industrial scale, and that it allows us to obtain the required performance. For example, in certain cases we use hexavalent chromium to facilitate the adherence to other coatings on the support material. So we will have to qualify a product which offers the same functional characteristics while still allowing us to incorporate it in a controlled manner in our manufacturing procedures. Finally, we have to keep in mind that in other cases hexavalent chromium is used in the final stages of the process and therefore persists on the surface. If we replace it, we have to make sure that the new connectors are compatible with the connectors already in the field, because they may be in contact with each other. It's possible but it's a really complex challenge, wouldn't you agree? TP: In fact, as of now we don't have just one replacement solution, because chrome is not always used for the same purpose; it depends on the materials and the final treatment. Our approach has been to categorize our connector components according to their material, identify the electrochemical mechanisms in play and carry out a large number of tests at different stages from the bath to the pilot production line, orienting our research towards multiple solutions. So what is the current status of your research? TP: We no longer use hexavalent chromium in the treatment of composite housings. First of all, we perform a tribofinishing process to modify the surface properties and allow our new preparation treatment (hexavalent chrome-free) to facilitate the adherence of the successive metallic coatings. For aluminium connectors, we have also eliminated passivation with hexavalent chromium in our zinc-nickel treatment process while developing a new procedure using a substance certified and authorised by REACH as non-hazardous. We have thus reduced our annual consumption of hexavalent chromium half, from 8 to 4 tons. Was this an easy transition? TP: Obviously it wasn't. It took us several years to put this new "technological building block" into place and to validate it, because it is not just about validating a concept in the lab, it has to be reproduced at scale and over a long period. In some respects, one has to build up experience. Take for example electroplating baths which contain up to several hundred litres. Their composition and perfect mastery of the process are the result of experience in numerous aspects: the immersion time and the concentrations of the different products have to be validated. We have to make sure there's no impact on the geometry of the parts and monitor the aging of the baths to guarantee the quality of the treatment, etc. Dozens of parameters have to be taken into account, analyzed and mastered. What is the status of hexavalent chromium for cadmium-plated connectors? TP: Currently, only hexavalent chromium passivation can guarantee high resistance to corrosion and excellent electrical conductivity while retaining a non-reflecting and dark appearance which are still essential characteristics of military products. One of the solutions developed as an alternative to cadmium deposition is based on a zinc-nickel treatment with a hexavalent chrome-free passivation. This make is possible to have finished products which offer excellent characteristics while still guaranteeing full compatibility with the equipment already installed. However this solution is not necessarily going to be the right one in every case. We are continuing to use hexavalent chromium in cadmium- plated products to meet certain customer requirements or to reach markets outside Europe where the regulation does not apply and where we nevertheless have to stay competitive. We have obtained an exemption from the European Chemicals Agency for 12 years, which we are using to continue our research, and at the same time we are analyzing the techniques used in other industries, such as the car industry for example. Our final goal is naturally to completely eliminate of hexavalent chromium from all of our manufacturing processes. 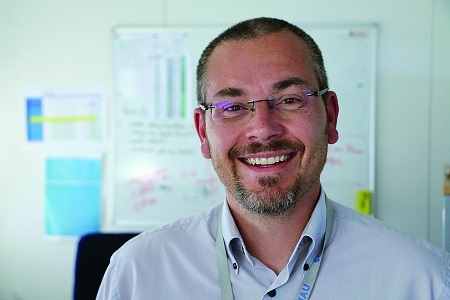 TP: As soon as the European REACH regulation was put in place, the management of SOURIAU ESTERLINE and the whole team realized that we had to launch a major program to innovate our surface treatment technology so that we could keep the production of our connectors in France. It's a major effort in terms of investment and it has also strengthened the cooperation between our teams and with our customers as well. Our desire to demonstrate our capacity for innovation, by finding replacement solutions for hexavalent chromium, is strengthening our experience and leveraging our know-how. Our customers are supporting us in this task; they know that we are on the right path going forward for the future. We have to protect human health and the environment.